Flash More Fish with the “Do-Jigger”! 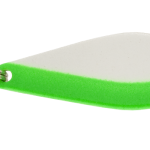 The 2 1/4 inch Do-Jigger is great as a spin casting lure in summer for big trout, northern and bass, and the 1 3/4 inch Do-Jigger as a casting or trolling lure for kokanee, jacks, smaller trout and bass. Solid brass lure with nickel or white pearl finish. Made in America.